For other uses of "Brad", see Brad (disambiguation). Brad was an American rock band that formed in Seattle, Washington in 1992. Their sound was influenced by the wide variety of influences brought by its members, including Stone Gossard of Pearl Jam, Regan Hagar (Satchel and formerly a member of Malfunkshun), Shawn Smith (also a member of Pigeonhed and Satchel), and Jeremy Toback. Stone Carpenter Gossard is an American musician who serves as the rhythm and additional lead guitarist for the American rock band Pearl Jam. Brad formed officially in 1992, although the band members had been playing together for a long time before that. The band's line-up was composed of vocalist Shawn Smith, guitarist Stone Gossard, bassist Jeremy Toback, and drummer Regan Hagar. The band originally wanted to go by the name Shame, however the band found that the name was already taken by a band featuring musician Brad Wilson. Instead, the band took the name Brad and decided to name its debut album Shame. Shame , released on April 27, 1993 through Epic Records, was recorded in roughly 20 days, with many tracks taken from in-studio jam sessions. Shame, featuring a raw sound and an eclectic mix of styles, was released to mixed reviews and moderate sales. The track "20th Century" was a minor hit in the UK. Shawn Smith was an American singer, songwriter and musician who was a member of several Seattle alternative and indie rock bands, such as Brad, Satchel, Pigeonhed and The Twilight Singers, as well as a solo artist. Regan Hagar is an American musician. Primarily a drummer, he also plays keyboard and guitar on occasion. Shame is the debut studio album by the American rock band Brad. It was released on April 27, 1993 through Epic Records. The band's follow-up album, Interiors , released on June 24, 1997, was much more polished. Tom Moon of Rolling Stone said that "what's most notable about Interiors...is the pure pop focus of these nuanced compositions." The lead single from Interiors, "The Day Brings", features Mike McCready from Pearl Jam on lead guitar. Interiors was met with poor sales, however the band saw its cult audience expand. The album was accompanied by a tour in the United States and Canada that same year, as well as a small tour in Australia and New Zealand in 1998. Interiors is the second studio album by the American rock band Brad. It was released on June 24, 1997 through Epic Records. A third album, Welcome to Discovery Park , was released on August 13, 2002 through Redline Records. The recording of Welcome to Discovery Park saw contributions from Mike Berg, who had taken over as the touring bassist for Toback. The album mixes the rawness of Shame and the polished, produced sound of Interiors. Bradley Torreano of Allmusic called it "another quality album that still leaves the listener hungry overall for some better songs." In July 2005, the band released an album of unreleased and incomplete Brad and Satchel tracks called Brad vs Satchel through The Establishment Store. Welcome to Discovery Park is the third studio album by the alternative rock band Brad. It was released in 2002 on Redline Records. Redline Records was an independent record label based in Perth, Australia. Started in the year 2000 as a joint project between the band, Jebediah, and its management company, Naked Ape Management, the label predominantly released recordings of Australian indie bands under licensing agreements. Redline Records was distributed by Shock Records in Australia and New Zealand. Satchel was an alternative rock band from Seattle. Their final lineup featured Shawn Smith, Regan Hagar, and John Hoag. Brad playing on their opening date of their European tour in Manchester, England on February 8, 2013. The band's fourth studio album, tentatively titled Best Friends? was recorded in 2003 and was being prepared for release in 2006. In September 2007, the album was still awaiting release as the band reunited for a small series of live performances, starting in October 2007, with Kevin Wood (of Malfunkshun) joining the band as an additional guitarist. Songs from the forthcoming Best Friends? album were played at the 2007 and 2008 performances. Malfunkshun is an alternative rock band formed on Easter Sunday in 1980 by Andrew Wood and his brother Kevin Wood and is often recognized as one of the "Founding Fathers of the grunge scene" or the "Godfathers of Grunge". They formed around the same time bands such as The U-Men (1981), Melvins (1983), Green River (1984) and Soundgarden (1984). Brad performed live at Seattle's Showbox on April 14, 2010 and news about 'Best Friends?' imminent release was posted on their official website. The album was released on August 10, 2010 through the Pearl Jam website. Brad toured the U.S. with Band of Horses in support of the album. Band of Horses is an American rock band formed in 2004 in Seattle by Ben Bridwell. The band has released five studio albums, the most successful of which is 2010's Grammy-nominated Infinite Arms. The band's lineup, which included Mat Brooke for the debut album, has undergone several changes; the most-recent lineup of Bridwell, Ryan Monroe, Tyler Ramsey, Bill Reynolds, and Creighton Barrett, had been together for several years until Ramsey and Reynolds' departure in 2017, recording three albums. In 2011 the band announced that they would record and perform on a more permanent basis and signed a new record deal with Razor & Tie. The band spent many months in the recording studio for what would become their fifth record United We Stand . United We Stand was released on April 28, 2012 followed by a short US tour. Later that year their first European tour was announced which started in February 2013. ↑ Gumbuoy. "Hang Out In Discovery Park With Brad" [ permanent dead link ]. fasterlouder.com.au. September 27, 2005. 1 2 3 Erlewine, Stephen Thomas and Torreano, Bradley. "Brad". Allmusic. Retrieved on January 31, 2009. ↑ Moon, Tom. "Brad: Interiors". Rolling Stone . July 28, 1997. ↑ Torreano, Bradley. "Welcome to Discovery Park". Allmusic. ↑ Prato, Greg. "Brad Finishing Up Fourth Album". Billboard . January 18, 2006. ↑ Young, Alex (April 6, 2019). "R.I.P. Shawn Smith, singer of Seattle rock band Brad dead at 53". Consequence of Sound . Retrieved April 7, 2019. ↑ "UK Singles & Albums Chart Archive — Brad" . Retrieved December 8, 2007. Mother Love Bone was an American rock band that formed in Seattle, Washington, in 1987. The band was active from 1987 to 1990. 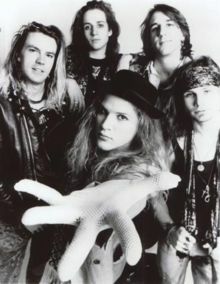 Frontman Andrew Wood's personality and lyrics helped to catapult the group to the top of the burgeoning late 1980s/early 1990s Seattle music scene. Wood died only days before the scheduled release of the band's debut album, Apple, thus ending the group's hopes of success. The album was finally released a few months later. 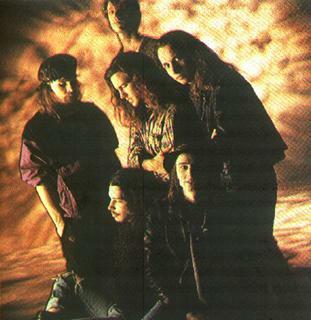 Temple of the Dog was an American rock supergroup that formed in Seattle, Washington in 1990. It was conceived by vocalist Chris Cornell of Soundgarden as a tribute to his friend, the late Andrew Wood, lead singer of the bands Malfunkshun and Mother Love Bone. The lineup included Stone Gossard on rhythm guitar, Jeff Ament on bass guitar, Mike McCready on lead guitar, and Matt Cameron on drums. Eddie Vedder appeared as a guest to provide some lead and backing vocals. Green River was an American rock band formed in Seattle, Washington in 1984. 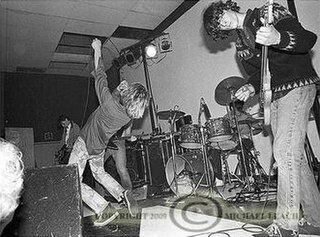 Although the band had very little commercial impact outside their native Seattle, Green River pioneered the grunge music genre. The grunge style was featured both in Green River's own music and the music its members would create in future bands, including Pearl Jam and Mudhoney. Green River reunited for several live shows in 2008 and 2009. Andrew Patrick Wood was an American musician best known as the lead singer for alternative rock bands Malfunkshun and Mother Love Bone. Wood was also known for his flamboyance. Return to Olympus is the only album by the alternative rock band Malfunkshun. It was released after the band had broken up and after lead singer Andrew Wood had died of a drug overdose in 1990. 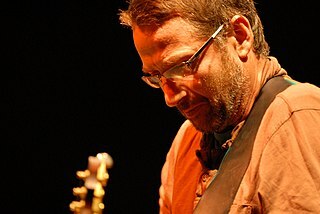 Stone Gossard, of Pearl Jam, had compiled the songs and released the album on his label, Loosegroove Records. David Karl Krusen is an American musician who is best known for being the first drummer for the American rock band Pearl Jam and for his work on the band's debut album, Ten. Krusen was also a member of the bands Hovercraft and Unified Theory, and is currently the drummer for Candlebox. 6/22/00 – Milan, Italy is a two-disc live album and the twentieth in a series of 72 live bootlegs released by the American alternative rock band Pearl Jam from the band's 2000 Binaural Tour. It was released along with the other official bootlegs from the European leg of the tour on September 26, 2000. Brad vs Satchel is a compilation album of unreleased and incomplete tracks by the American rock bands Brad and Satchel. It was released on July 26, 2005 through The Establishment Store. Loosegroove Records was a Seattle based record label formed by Pearl Jam guitarist Stone Gossard and Brad drummer Regan Hagar in 1994. Initially a subsidiary of Sony before going independent in 1996, Loosegroove signed many up and coming artists from various musical genres, especially rock and hip hop. Significantly, Gossard signed Queens of the Stone Age to Loosegroove, releasing the band's debut album in 1998. Others who worked with Loosegroove include Critters Buggin, Weapon of Choice, Malfunkshun, Devilhead, Prose and Concepts, Ponga, Hi Fi Killers, Nash Kato and Eureka Farm. Loosegroove also released the Seattle Hip Hop Compilation 14 Fathoms Deep in January 1997. Loosegroove Records closed in 2000. In 2000 the Loosegroove catalog was acquired by WILL Records, who now operates as Lakeshore Records. Tyler Coffey is a musician and record producer based in Seattle, Washington, and Los Angeles, California. He is known for playing guitar in "With Friends Like These" who signed to Sound vs. Silence Records in 2009. Their debut, Dead and Gone, was mixed by Barrett Jones. Soon after the release of the record, the band took a hiatus to pursue other things. Coffey is also a part time player and contributor to Brad, featuring Shawn Smith and Stone Gossard. United We Stand is the fifth studio album by the American band Brad. It was released on April 24, 2012. To promote the album the band toured, including their first ever shows in the United Kingdom. It was the final studio album to feature frontman Shawn Smith, who died in April 2019.